I lovelovelove homemade marshmallows. I've never made anything beyond the basics before, and these are so dear. Maybe I can convince Cal to wrangle some with me this weekend! I love marshmallows, so sticky and funny ! These are adorable and perfect for Valentine's day! These look so pretty and yummy. the sweetest ever:) lovely idea! I had no idea you could make homemade marshmallows! This is precious! OMG this looks wonderful! So delicious!! i love raspberry anything...these look amazing! I love making marshmallows - so fun & so easy. I throw a tea towel over the top of the mixer once I crank it up to full blast - once it flung marshmallow all over the cabinets, so that's my little tip. soooo yummy! These are great! I made them a few years ago when I still had my big kitchenaid--so heavenly! My husband and I make homemade marshmallows every year as Christmas gifts and I have always wanted to try to make flavored ones. I didn't realize it was as simple as using flavored jello! This sounds awesome, and easier than I expected! Ooh I didn't realise they were so easy to make! Might whip some up to impress the girls at work. No electric whisk though...good old womanpower will have to do the trick! These. Look. Amazing. Love to hear that the texture isn't tricky!! 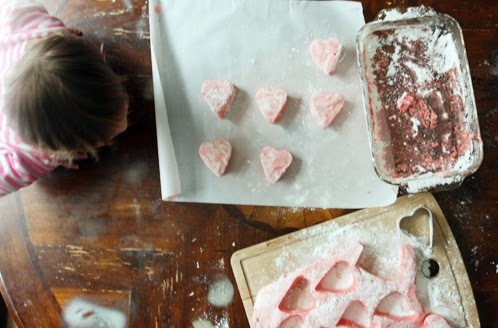 And raspberry marshmallows is so fun for valentine's day!! these are so pretty! i have been meaning to make marshmallows all winter! i better hop to it, huh! Yum! When I lived in France they had gorgeous, fresh marshmallow at fairs and festivals. They came in huge, long sticks that were floppy and soft. They tasted nothing like our American marshmallows and came in flavors like raspberry, lavender, creme brûlée, and other really exotic things! I'm happy to see the trend here now. Love this post!